Before taking in a pet of any kind, the potential owner must be prepared not just for the joys, fun times and many blessings a companion pet can bring, but also to be able to respond and give adequate care to said pet when affected by illness or injury and to give continual support during the senior stage of a pet’s life. Having the means and ability to provide basic first aid to a pet and a competent avian vet to give the specialized medical attention when needed can truly make a big difference in the pet bird’s life. And this is not just in an emergency situation, but through the general health routine checks and when giving additional care in terms of helping a pet to live the senior stage of their life in comfort. By having a deeper understanding and connection with the pet bird, it’s easier to detect the first signs of trouble and to act in terms of having the issue properly addressed and to give the most adequate care and treatment. Even despite having the pet bird on a safe and controlled environment, an accident can still happen. Whether it was caused by the owner’s momentary lapse or by an event which was absolutely out of reach, it’s important to take fast action in terms of assisting the bird and to give first aid care when needed. If it’s a minor injury and the bird is actively bleeding, then stopping the blood loss is top priority and this can be achieved by applying cornstarch on the affected area. To clean the wound, sterile saline solution is a good option and for disinfecting and helping with healing, Betadine should be used. These are all basic items that should always be kept in the household in case they’re needed. When the injury is more severe, after doing basic first aid (if bleeding is involved), the owner should have a small padded hospital cage ready and take the bird to the nearest avian vet clinic or emergency hospital vet where avian vet services are available. Depending on the extent of damage done on the area, the bird can end up by having a permanent disability. There are different ways where a pet bird can end up with a disability. Due to a combination of factors, chicks can hatch with varying disabilities, whether they come from very small malformations/deformities on the foot, toes, wing and beak areas, or as a result of a debilitating condition, such as French moult, where in most cases the bird will be unable to fly. While there is no definite cure for French moult, depending on the type and level of severity, it’s possible to improve and control this condition, by having the bird on a special diet which caters to their specific needs. Budgies and pet birds with French moult will require an ongoing special care for the rest of their lives. When there is lack of adequate care given to young chicks and the proper nest box and bedding aren’t available, the chicks have higher chances of developing splayed legs and when not corrected in time, the chicks will end up with a permanent disability. For the most part and depending on the cases, these chicks hatched with a disability cope very well with their condition, and are perfectly able to grow into adulthood and lead normal and fulfilling lives. Due to unfortunate accidents or circumstances out of our reach (such as the development of growths/tumours), our pet birds can directly be affected and will have to adjust to life with a disability. 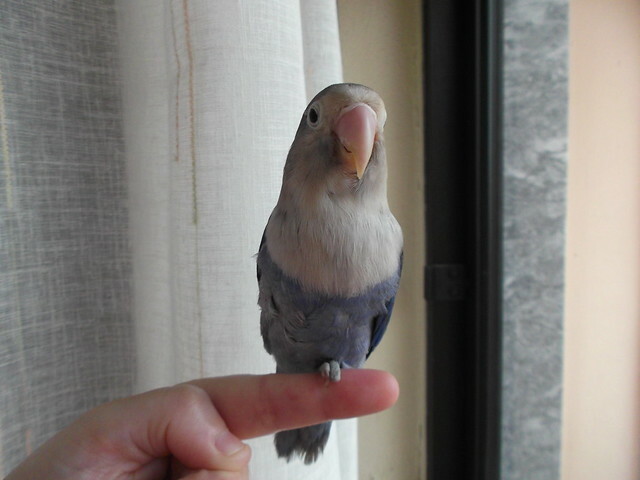 It is our job as responsible pet owners to make all the necessary changes and arrangements in order to better accommodate a bird who will from that moment on be special needs. This can be translated into adapting the cage and play areas for a specific bird and by placing platform perches, ramps or ladders to help the bird to move around and to have a few easy to reach comfortable places to rest when needed. Depending on the cases, additional physical therapy may be needed in order to improve the bird’s natural reflexes and general mobility as they adjust to the new reality. During my 27+ years of budgie ownership, I have come across multiple cases where my pet birds or adopted rescues would have some kind of disability. This part is merely an account from my personal experience in dealing with adversity and embracing diversity with a few choice pet birds who have truly made an impact in my life. The very first two budgies I had (two females), one of them was already in a way differently-abled. By the time Rosi came to our family, we noticed she was blind in one of her eyes. The way she behaved and her daily routines were not in any way different when compared to her mate and later on to the rest of her flockmates. Despite being visually impaired, this did not prevent her from having a long, fulfilling and happy life. 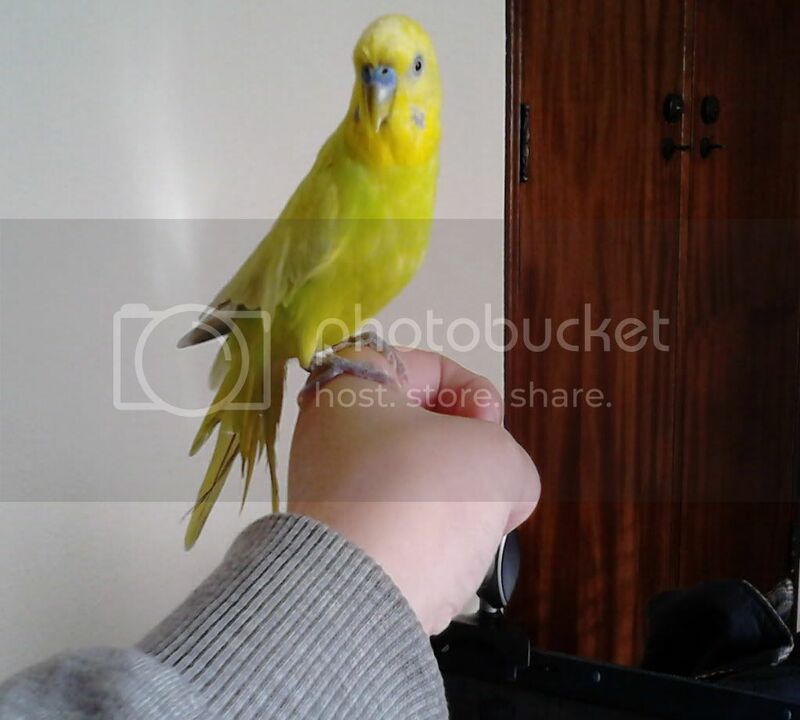 I was blessed by her companionship for 9 good years and she was the one who truly made me fall in love with budgies. Later on and while breeding budgies, I have had over the years the few odd chicks to hatch with small malformations/disabilities. They mainly ranged from minor foot disabilities and underdeveloped toes or missing a toenail or two. All chicks grew into adulthood with no trouble at all and again acted as if they had no physical issues whatsoever, they have always managed to use both feet well not just for moving around and climbing, but also to perch. At one point in time, I had an albino chick whose wings were underdeveloped and shorter in size (wing deformity) and due to this he was never able to fly. His name was Speedy Gonzales, his happiness and zest for life were truly contagious. 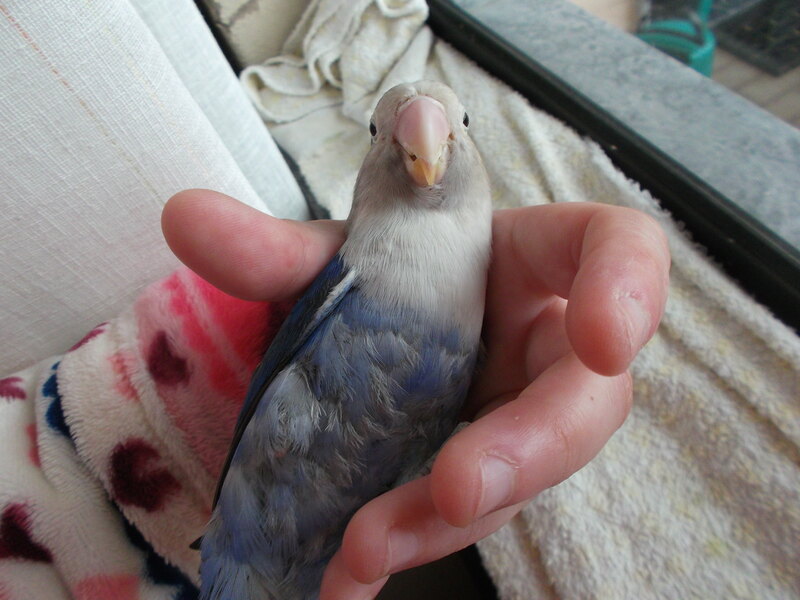 He was one of the sweetest and most special budgie friends I have had. As for lost rescued stray pet birds, the way I got my budgie Tito was through a neighbour whose dog (a grown up toy poodle) attacked and violently ripped out little Tito’s tail feathers and in the process the bite also made a puncture wound on the lower back area. By the time Tito was rescued, he wasn’t yet 3 months old and already had gone through such a difficult ordeal. After daily treatments he healed up well and made a full recovery. His tail feathers however, have never grown the right way, they would permanently be dishevelled despite the multiple moults. Regardless of not having “perfect” tail feathers, this did not keep him from flying beautifully and having as good of a balance as any other bird. The deeper connection and special understanding we had started out on day 1 from having him, and it was through a tragic event that we built our trusting bond. During the years that followed, Tito never failed to show his love, gratitude and extreme happiness when spending one-on-one time with me. More recently, there were two episodes with my lovebirds which were not at all expected. My Khaleesi suffered a stroke and this took a toll on his motor skills, especially his beak functions. Despite the circumstances not being the best, my lovie and I weren’t yet ready to part with each other and with the avian vet’s help and my refusal to give up on my boy, Khaleesi made a miraculous recovery. I used his love for toys and playing to perform physical therapy on his beak and with time he managed to recover his motor skills on the beak to almost 100%. Even though he is able to eat by himself and leads a normal life, he is closely monitored daily and is under a strict and controlled diet. While not having a physical disability, he is still a special needs bird and will be having the appropriate ongoing care specific for his case. I will finish up with Sindel’s story, her disability came from an unforeseen accident where a night fright and a supposedly "safe" closed metal leg band came into play. Upon waking up through the commotion in the bird room, I quickly assisted Sindel and took her to the emergency hospital vet. I was given two options by the vet. Knowing my Sindel’s personality, the fact the vet said despite the accident she was in very good condition health wise and that her mate Nico would be utterly heartbroken and would likely be unable to carry on without Sindel, I made the decision to let her undergo life-saving surgery. 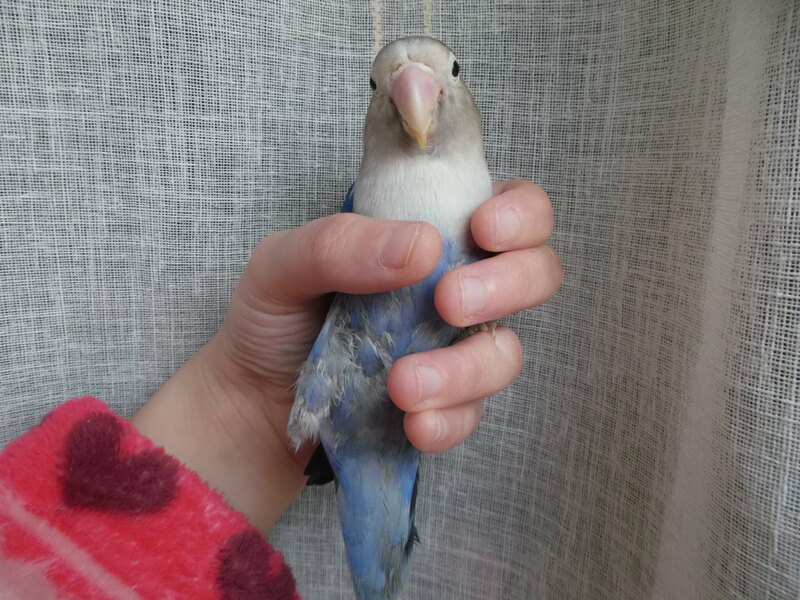 Part of her foot was amputated and I was about to face the most challenging of times as a pet bird owner. The surgery was a success and Sindel came out victorious, the wise and serene look on her eyes gave me the strength and courage to do my very best by her during the post surgery recovery. She was under close watch 24/7 for the next month and a half, this was done as to prevent her from picking on her wound and letting it heal. The way she adapted to her new condition was truly remarkable and I can say without a doubt that Sindel is the strongest bird I have ever had, her intelligence, very strong will, strength of mind and resiliency still amaze me to this day. After she was completely healed I have also started physical therapy to help her out in using her shortened leg, through simple reflex exercises which later on turned into better movements. She is now able to use her stumpy leg for extra support when perching and sometimes she also uses it to walk or for balance purposes. Sindel about to have one of her therapy sessions. This is a safe handling for her specific case, she is in no way being harmed. Her level of trust and tameness allows this handling, she never squirms to break free and my grip isn't tight. She lays on the palm of my hand and then we have a short session of leg movement exercises and a little petting on the beak as a reward (she loves those). To sum up, whether we get a bird who is special needs or they become differently-abled later on in life, it’s important to make the necessary adjustments to the new condition and provide ongoing support and special care. When there is love and dedication for the pet, the extra work is not a burden, quite the contrary, it’s very rewarding to see our efforts paying off when seeing how happy and well with life our birds are. The bond we have with them will also be stronger. When it comes to a disability that happens later in life due to an accident, we must allow ourselves to mourn and accept the new condition and depending on the cases, we must also forgive ourselves for our shortcomings and vow to do the very best for our pets. RIP sweet Tito (Summer 2008 - January 17th 2013). You are missed and never will be forgotten.